When Gustav Stickley published The Craftsman in the early 1900s, he gave a jump start to the Arts and Crafts movement and the Craftsman style home. These homes often feature low pitched gable roofs, exposed beams and rafters, wood or stone siding, and generous porches. 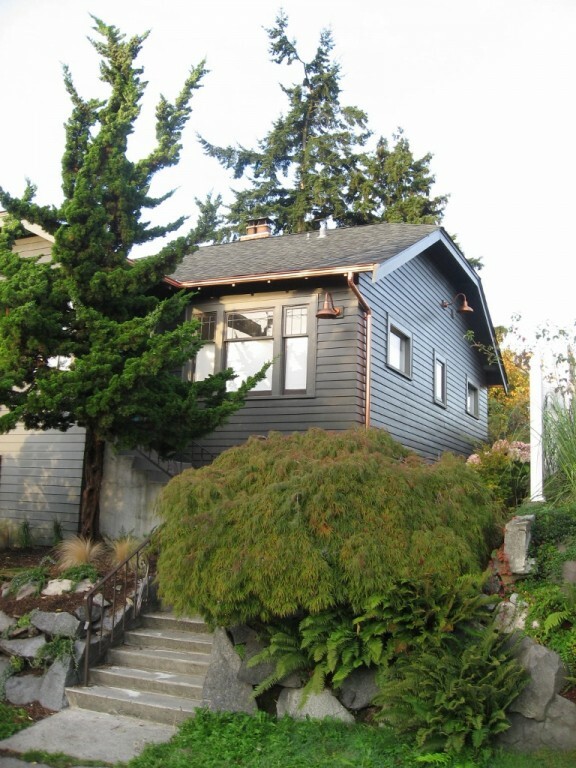 In an up-and-coming neighborhood in Seattle, Mira recently did an extensive exterior renovation of her 1927 Craftsman home where she restored the original trim, replaced the siding, added two large bay windows, and replaced the existing gutters and lights with new copper ones. “We really like the juxaposition of modern and vintage, hence the very modern dark-on-dark exterior paint,” Mira says. “We still did the traditional craftsman three-color, but we modernized the palette and added a bright door for contrast.” Mira calls the home style Modern Craftsman Barn. 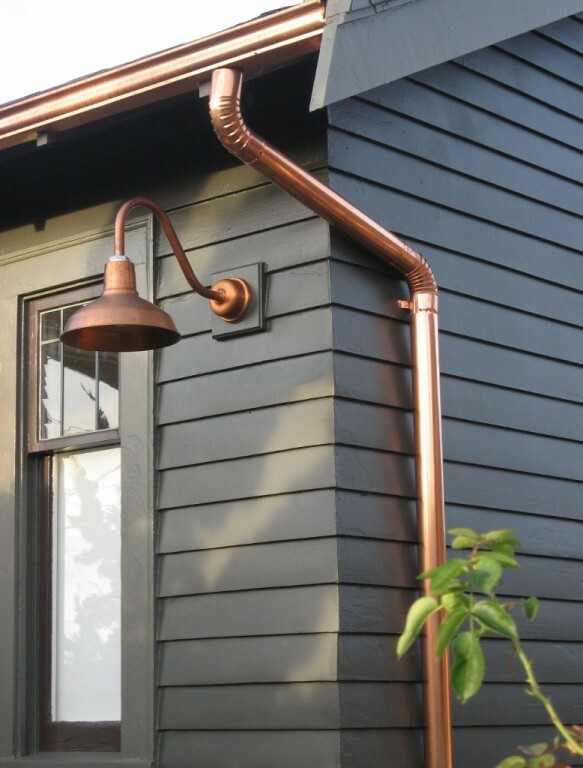 Mira chose copper gutters and copper gooseneck lighting because she loves the way the patina develops over time, giving the exterior some warmth and a subtle sparkle too. “The neighborhood we live in has a nautical history so the copper is a nod to this, plus it will age well in the salt air,” she notes. 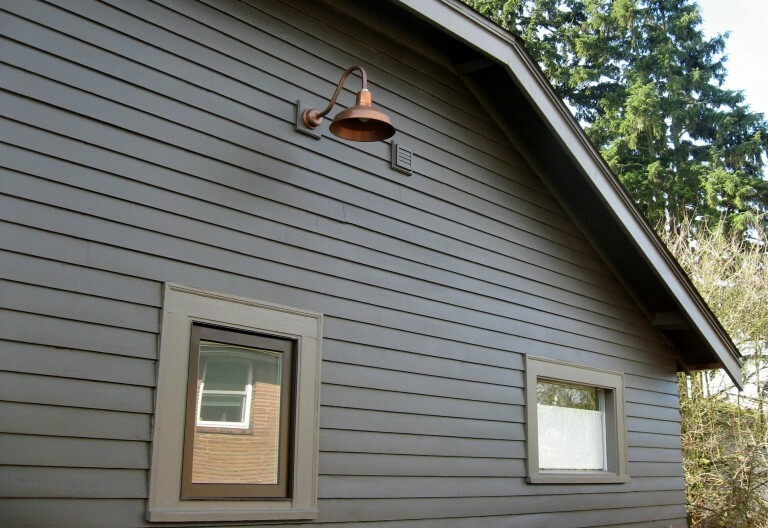 “We chose barn lights because we have clipped gables and our house has a barn look. They seem to fit perfectly with the look we were going for.” Mira chose four 12″ Drake Copper Gooseneck Lights and one 14″ version all with G15 copper gooseneck arms and copper backing plates. 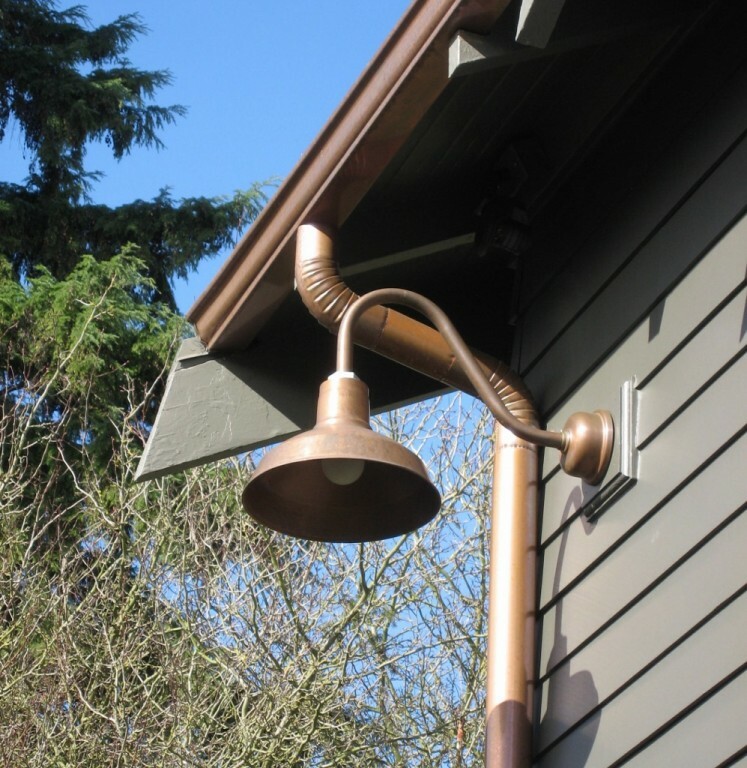 These outdoorgooseneck lights are hand spun from solid raw copper by Barn Light Electric artisans. “We placed the lights near each corner to light the path around the house and the front stairs,” Mira says. “One of the smartest things we did was have our electrician install motion sensors for each light high up under the eaves so they don’t contrast visually with the lights.” The lights come on automatically whenever someone walks by or the lights can be turned on to stay on if needed. “We really like how the barn lights add to the barn look of the house and aren’t what you would expect with a traditional craftsman home,” Mira says. “The copper lights and copper gutters are a really nice exterior touch together. It just adds an element of depth and some shine!” But Mira’s favorite quality of her new lights was unexpected. Porcelain Enamel vs Powder Coat | What’s the Difference? This is house looks beautiful . The copper lighting adds the perfect touch! The house color make the copper pop. Yes Kim, Mira did a wonderful job choosing colors and finishes to stay true to the Craftsman style but still giving her home a nice modern feel! Where on earth did that girl get her good taste?? Hope that helps! I appreciate it! Beautiful. 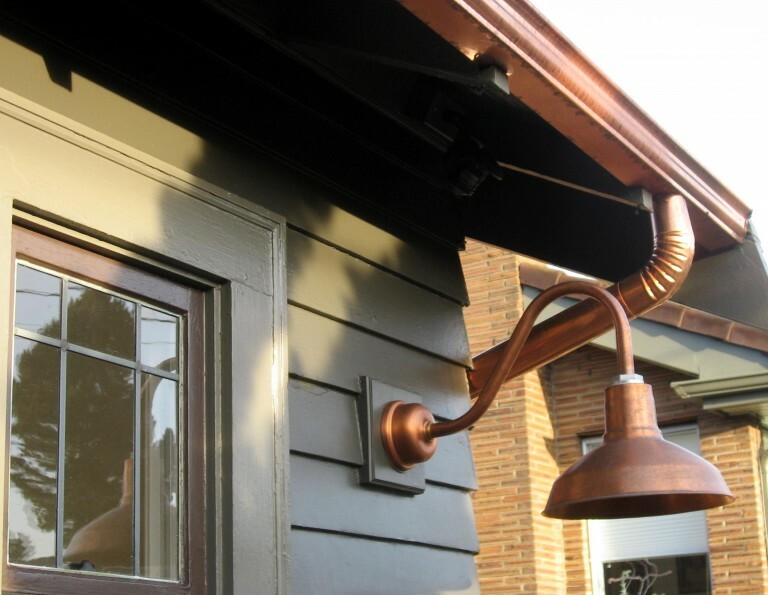 Did you get the raw copper or aged copper color barn light? Mira ordered the Raw Copper finish on her exterior lighting. Isn’t it gorgeous?! Thanks for checking out the blog! How long did it take for the raw copper to get the aged look? 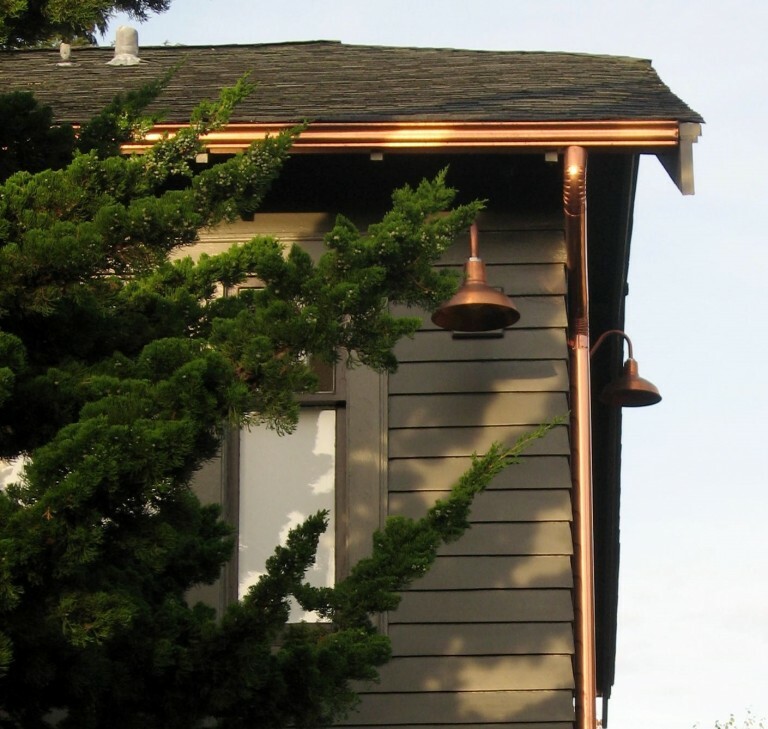 My house is the same color and I am concerned the copper will be too shiny. Copper is a living material and will start to patina almost immediately. But how long it takes to achieve the “aged” look depends upon your environment. The dryer the climate, the longer it takes. You can also choose our Oil-Rubbed Copper or Weathered Copper finish to achieve the “aged” look instantly!